Hugh Robjohns has a close encounter with Panasonic's newly launched budget digital console, and finds it up there with the best of them. Panasonic have already built up something of a reputation for their wide range of digital products such as DAT machines and CD players, and their pro-audio arm Ramsa have a certain credibility in the live sound arena. However, this is their first foray into digital consoles, and most impressive it is too. The DA7 is a fully automated assignable mixer with comprehensive equalisation and dynamics on every channel and mix buss, 32 main inputs (with up to 24 ADAT, TDIF, AES-EBU or analogue I/Os via three further option cards), six aux sends with dedicated returns, eight mix busses, external MIDI device control through a separate fader layer, and 5.1 surround mixing capability. An optional timecode card allows synchronisation with external machines and video systems, there is an optional meterbridge, and the entire console can be controlled remotely from a PC or Mac. The only thing the DA7 does not provide is onboard effects, but I'm not sure I would class that as a drawback. 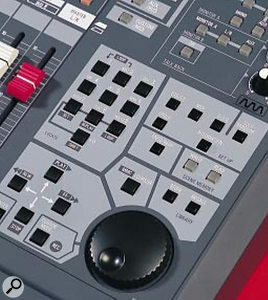 The number and flexibility of the aux sends and insert points is perfectly adequate for most applications in which the Ramsa would find itself, and it avoids the duplication and redundancy of effects which tends to occur when a studio replaces its trusty old analogue desk with a shiny new digital one with its own built-in effects. The DA7 is large, heavy and solidly built — although it can be lifted by one person, I would recommend having help to lift its 23kg bulk out of the packing case. Without the meterbridge attached the mixer measures 698 x 244 x 550mm (WHD), with a padded armrest across the front, a delightfully clutter-free control surface (made from a hard ABS resin material) and a large backlit LCD panel in the top-right corner. The input channels occupy the left side of the console, whilst the central and assignable controls are arranged over towards the right. A cooling fan is present in the left end-cheek panel, but it appears to be thermally controlled and remained blissfully silent during my time with the console. The rear panel is clearly laid out, with connectors arranged on four levels. The top row provides balanced analogue inputs on XLRs for the first eight channels, handling nominal signal levels from -60 to +10dBu with phantom power individually switchable from the assignable channel controls. Inputs 9-16 are provided with balanced quarter-inch TRS jack sockets covering the same signal range but without phantom powering. The row of connectors immediately below contains 16 TRS jack sockets providing unbalanced insert points imediately before the A‑D converters and operating at a nominal +4dBu level. The third row accommodates the auxiliaries, monitoring and master outputs. Starting on the right, Aux 1 and 2 are equipped with phono sockets carrying S/PDIF digital audio — one socket provides the two outputs and the other the returns. Auxes 3/4 and 5/6 are carried in pairs on TRS jack sockets as unbalanced analogue +4dBu signals, and two further jacks provide unbalanced analogue returns. Although rather unconventional, this arrangement works well enough provided suitable Y-leads are available to access the individual sends and returns and, in the case of stereo headphone cue mixes, the pairing works perfectly. 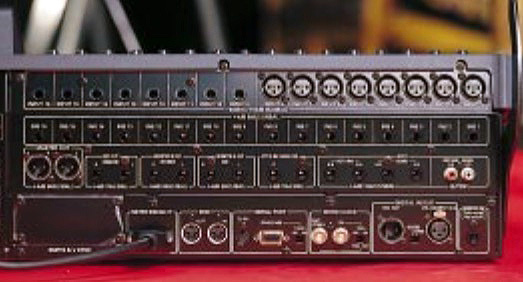 Back panel, showing the DA7’s comprehensive digital interfacing and generous selection of analogue inputs and insert points.The next pair of TRS sockets provides a 2‑track tape machine input to the monitoring in the form of a balanced analogue input operating at +4dBu. Two further pairs of TRS sockets furnish +4dBu balanced monitor loudspeaker feeds intended for control room and studio. Finally for this row, two sets of master outputs are available as a pair of jack sockets providing balanced +4dBu signals specifically for an analogue recorder, and a pair of XLRs to output the master L-R stereo buss. The fourth row of connectors is mainly taken up with digital housekeeping and remote control applications. On the extreme right, a two-pole jack socket accepts a footswitch which can be configured to activate the talkback and automation functions. Next are XLRs for a 2‑track digital machine giving a dedicated digital record output as well as a monitoring input. The digital 2‑track can also be routed to input channels 15/16 or directly to the stereo master output. A selection slide switch formats the data as either AES-EBU or S/PDIF. Next along are a couple of BNC connectors for word clock In and Out/Thru, complete with a 75Ω termination switch. The console's setup menus allow the desk to be slaved to an external word clock if required, and the word clock output enables other devices to be slaved to the DA7. Remote control is catered for with RS422/485 via a 9‑pin D-Sub connector (with obligatory termination switch), and RS232 on an 8‑pin mini DIN connector. Optional remote control software is available for both Mac and PC Windows environments, and depending on the computer system hardware, either of these serial interfaces can be used. 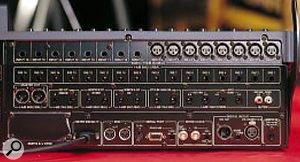 A pair of MIDI sockets is provided, and a 15-way D-Sub connector connects the optional meter bridge unit. To the right of the fourth row of connectors are four option slots, normally protected with blanking panels. One of the slots is designed to accept an optional SMPTE/Video Sync card which accepts longitudinal timecode for automation synchronisation, and video black and burst for digital synchronisation in a video post environment. The other three card slots can accept any of the four available audio interface cards. Slot 1 corresponds to inputs 17-24, Slot 2 to 25-32, and Slot 3 can be assigned through a configuration menu to replace analogue inputs 9-16. 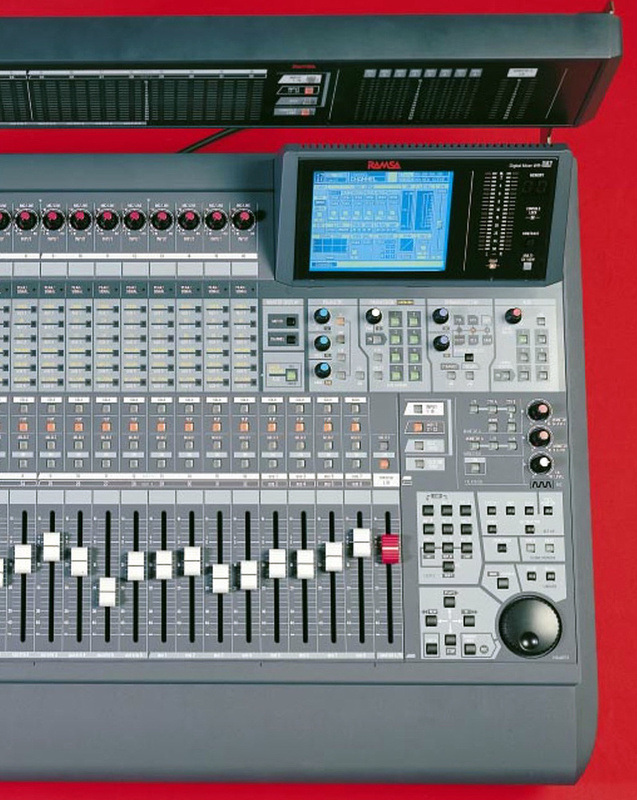 Thus the console could accommodate 24 tracks of digital recording, as well as up to 16 analogue inputs (with online switching between analogue and digital inputs for channels 9-16 if required). Slot 3 can also be used to accommodate a Tandem card to link two DA7 consoles together. The current option cards all provide eight channels of I/O and include an ADAT interface (with a pair of lightpipe connectors), TDIF1 for DTRS machines (with a single 25-way D-Sub connector), AES-EBU or S/PDIF (via a 25-way D-Sub connector); and an analogue card with a pair of 25-way D-Subs for balanced +4dBu inputs and outputs. This last card can be used in Slot 3 to provide eight analogue insert points for digital signals within the mixer. The Tandem card already mentioned carries a single 25-way D-Sub connector and a slide switch to determine which console is the master and which the slave. 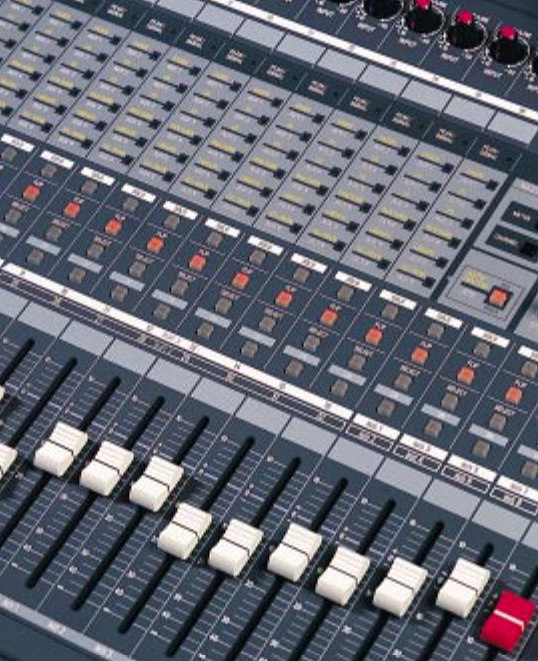 The Ramsa DA7 desk, like most digital consoles, relies heavily on assignability of controls, and therein lies the only real cause for complaint. Almost every control on the console seems to have several legends to signify multiple roles under different operating conditions! Whilst this cuts down on the number and diversity of knobs and buttons, it also makes the console very confusing to operate at times. To be fair, the use of multi-coloured LED status indicators all over the console gives useful clues as to what is going on, as do messages in the LCD screen, but even so, during the time I had the console I never really felt truly 'on top of it!'. Above each fader are four channel buttons: the Flip button allows individual faders to control channels from either of two blocks of 16. Above these, six LEDs display either the activity of aux sends on a channel or its automation status, and a further LED indicates the presence of a signal and warns of clipping.There are 21 physical faders, each with a professional 100mm travel, and these are organised into four 'pages' to control the additional inputs and buss masters. The first fader layer accesses inputs 1-16 (or analogue inputs 1-8 and Slot 3 inputs 9-16), the second Slots 2 and 3 for inputs 17-32. The third layer provides the six auxiliary sends and returns plus the busses, and the last layer caters for remote MIDI devices whose parameters may be controlled from the faders. The console includes comprehensive MIDI data allocation to make this facility extremely versatile. There will obviously be times when you want to control, say, inputs 1-16 but wish to replace channel 2 with channel 18, and this is possible thanks to Flip buttons on each channel which allow independent access to a different layer. Flipped channels can be brought back into line either by pressing each flip key, or by holding a fader layer button down for more than two seconds. Besides this Flip button, three other buttons are arranged above the fader: On, Select, and Solo. The functions of these will be self-explanatory, but it is worth mentioning that the Solo mode can be customised in a setup menu between PFL, AFL and solo-in-place, and the Select key is used to assign the central channel facilities to a particular channel (or pair of channels if linked). Above the four channel buttons, seven LEDs display the status of the channel. Normally, the first six of these LEDs illuminate green to signify if any of the aux sends are active, but when switched to show the automation status will turn red to confirm which aspects of the channel are being automated — channel fader, EQ, pan/assign and so on. The topmost LED is a signal/peak light which flashes green when signal is present and red when it approaches clipping. At the top of the strip an analogue input gain knob scaled from +10 to -60dB determines the channel's analogue signal gain. No input pad switch is provided, but the input amplifier appears to have a very high overload margin and sounds very clean. The five faders on the right-hand side of the desk control the eight mix busses (in two layers) and the main stereo output. Again, the buss faders have flip buttons to access busses 5-8 instead of 1-4, but the master fader is simply equipped with a Select and an On button. In use, the faders feel nice enough and although they have quite a lot of mechanical inertia, they can be flicked closed or open without too much effort. When moving under automation they can be quite rattly, and if a pair of channels are linked for stereo operation it is essential to move just one fader of the pair, as trying to drag both causes the motors to fight back! Fader motors can be switched off from a configuration menu if preferred. The assignable channel controls reside directly below the LCD screen in a horizontal strip which starts with three buttons. Two of these determine the 'home base' of the LCD display — either to show the status of a selected channel, or to provide one of three metering displays for channels 1-32, auxes and busses, or slot card inputs. The third button selects the display mode of the channel LEDs between aux sends and automation parameters. The Equaliser section has three knobs and five buttons, all of which are pretty intuitive. Four of the buttons determine the band being adjusted — high, high-mid, low-mid or low — and the fifth button toggles the equaliser on or off. The three knobs provide controls for Q, frequency and gain, and if the gain knob is pressed down a full equaliser display screen is drawn on the LCD panel. This shows a frequency response plot, a chart of settings for the three controls in each of the four bands, the filter type for the high and low sections, and a couple of other soft buttons for resetting the entire equaliser to flat, and for performing an A/B comparison with the last used equaliser setting. Also, if the Gain knob is pressed whilst the EQ window is already displayed, it will toggle to show the available A and B comparison settings. The top and bottom EQ sections can have either a parametric response like the middle two sections (the default setting), low or high-pass filters (respectively), or traditional shelf responses. In the parametric modes, the frequency range of each section extends to cover the full 20Hz - 20kHz, although the ranges of the top and bottom sections are more sensibly tailored in the filter and shelf modes. The Q knob adjusts the width of the parametric filters from a broad 0.5 to an extremely surgical 50! When adjusting the top and bottom sections, pressing this knob also cycles through the three available filter types. The Frequency knob adjusts the centre or turnover frequency of a selected filter, and also resets the equaliser to flat if pressed down. Fortunately, the knob is quite stiff to depress, but I inadvertently reset the EQ on several occasions before realising this hidden function was available — there are no panel legends to indicate the over-press actions of any of these knobs! In the latest v1.1 firmware, a new function has apparently been added whereby a single band of the EQ can be reset to flat by pressing and holding the relevant band button — a much better idea! As with most other digital consoles, the DA7 provides a library of 50 favourite equaliser settings; these are accessed through the Library Store/Recall buttons. Sometimes it is useful to be able to compare and copy equaliser settings between two channels, and the DA7 supports this feature too through the 'Multi-Channel View' mode. Additional labelling around the three equaliser knobs refers to controlling the routing level outputs when the desk is in the surround sound panning mode (see 'Surround Modes' box). The Q knob determines the left output, Frequency sets the left surround, and Gain the subwoofer channel level. The next section of assignable channel controls is the Pan and Assign section. This provides 11 buttons and a single control knob which, if pressed down, recalls the pan/surround window to the LCD. Again, the basic operation of the routing section is pretty self-evident. Buttons are provided for the eight mix busses, direct output and L-R master stereo buss. The pan control knob is always active for the L-R stereo buss, but must be switched on to pan between odd and even mix busses if desired. Use of the DA7’s many multi-function controls is aided by the large LCD. Below this, from left to right, are the EQ controls, multi- function buttons for controlling Pan, Assign and Surround mixing, another set of multi-function controls for dynamics and delay, and controls for the six aux sends. Pressing the Direct button recalls a new screen to the LCD allowing the eight outputs associated with each optional Slot card to be sourced from any input channel (1-32), aux send 1-6, buss 1-8 (default), or the left or right stereo master — in effect a comprehensive internal patchbay. Whilst on the subject of routing signals to the Slot cards, Slot 3 is different to the other two slots in that it can be configured to operate as a digital insert point returning signals into the six aux returns, the eight busses or the stereo master. If the A‑D/D‑A option card is installed, analogue insert points thus become available (although care may be needed to avoid time-delay problems due to the converters). The dynamics and delay section has only two control knobs and three buttons plus a collection of status LEDs, and is consequently one of the more fiddly sections to use. The two control knobs also perform right front and right surround levels when the desk is in surround mode. A 'Parameter Select' button cycles through three LEDs in the associated display to confirm the role of the knobs when used to determine dynamics paramters: Threshold and Ratio, Attack and Release, or Delay and Make-up Gain. The two remaining buttons select between controlling dynamics or delay functions. By pressing the lower of the two knobs, a dynamics set-up window is drawn on the LCD; this provides a transfer curve plot, a gain-reduction meter, a chart of the complete set of parameters, and some mode tallies. The dynamics section can be configured either as a compressor with an input gate, or as an expander, and there are four stereo linking modes to determine whether paired dynamics sections should be controlled independently, from just the left or right channel's controls, or from both channels (the default). The dynamics section can also be inserted in the signal path before or after the channel equaliser (but not after the channel fader). The dynamics sections are not as transparent as some digital designs I have heard, but neither are they as characterful as many analogue processors. Essentially they are usable, workmanlike tools providing good control of signal levels, but I would advise against attempting too much gain reduction with a single section. Heavy compression effects seemed to sound slightly better if two dynamics sections were cascaded — for instance in the channel and mix buss. Aside from having to repeatedly press the Parameter Select button to access and alter the various dynamics section attributes, the system works well enough, and having separate controls for the gate threshold, attack and release is welcome. The compressor is provided with threshold, ratio (from 1:1 to infinity:1), attack, release, and make-up gain — all with sensible ranges. The expander section has a similar selection of controls plus a range parameter to determine the maximum amount of expansion. Unfortunately, neither the gate nor expander have 'hold' parameters. The gain-reduction display is available from the dynamics page as well as the channel overview page, but I was disappointed that it is not possible to view gain-reduction metering along with the channel level metering displays, either on the LCD panel or the optional meterbridge. This is a great pity, as I have always found it most advantageous to be able to see how hard channel compressors are working during a recording, performance or mix. A delay line is associated with the dynamics module and is placed in the signal path immediately before the fader. Delay is adjustable in sample or millisecond increments up to 300mS (14400 samples at 48kHz). Just like the equaliser, a library of 50 presets is available for the dynamics section and memories can be recalled and stored in exactly the same way as for the equaliser. Similarly, it is possible to compare the settings of two channels simultaneously in the multi-channel view mode, and to copy settings between them. The Auxiliary section consists of a single control knob with eight push buttons. Six indicate the auxiliary send busses, a seventh determines pre- or post-fader send, and the last activates the Fader Control mode. When the latter is pressed, a special auxiliary display window is produced on the LCD listing the settings of a specified auxiliary across all 32 input channels. At the same time, the channel faders jump to reflect the relevant aux send level for each channel allowing, say, a monitor mix to be set up on the faders rather than the single control knob. The aux master send controls are accessed from a dedicated fader layer which presents the six aux send masters on channels 1-6 and the six aux returns on channels 7-12. Both aux sends and returns can be linked for stereo operation if required. 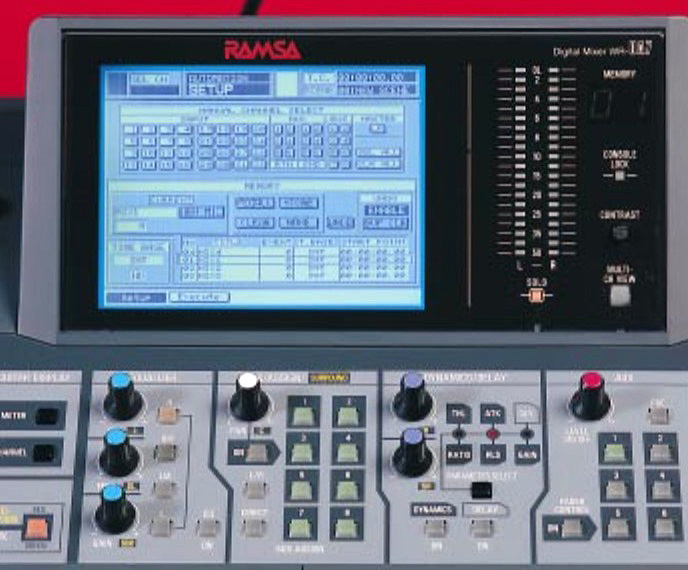 The basic Ramsa desk is provided with only a stereo bargraph meter to monitor the main master output, although the LCD panel can be used to display the channel levels if required. Meters can be selected for either VU or PPM characteristics, with or without peak hold. The optional meterbridge provides 16 bargraph meters on the left-hand side switchable to show channel inputs 1-16, 17-32, aux sends and returns. The right-hand side of the meterbridge always shows the eight busses and the control-room monitor outputs. The display can also be arranged to automatically follow the fader layer selection on the console. The monitoring controls on the DA7 are basic but adequate, with the panel divided into three sections: Monitor A (control room), Monitor B (studio), and Talkback. The control room section has switching for two 2‑track machines (one analogue and one digital), the master stereo buss, and the aux busses (in pairs with repeated pushing of the Aux selector button). There is also a mono button, but no manual dim facility. The studio loudspeaker selector (Monitor B) can be switched to listen to the master stereo buss, the Monitor A selection, or the aux busses. Both loudspeaker outputs have their own rotary level controls, and a headphone socket is also available under the front right-hand edge of the console, complete with its own volume control. The talkback section includes a built-in microphone and associated level control knob, together with a dedicated Talkback On button. This can be configured to exhibit either a momentary or latching action, and can be remotely activated through a footswitch connection on the rear panel (this footswitch automatically becomes a punch-in/out switch when the automation is recording). Talkback can be routed to any or all of three destinations: 'Slate' which sends it to all eight busses as well as the master stereo output, 'Moni B' which sends it to the studio loudspeakers, or 'All Aux' which sends it to the auxiliary outputs. The control room speakers automatically dim when talkback is used, but can also be permanently dimmed if desired to avoid the level disruption when talkback is activated. The dimming is ramped quite slowly and it is very easy to get a brief howlround between mic and control room speakers if talkback is routed to Slate. The last operational controls on the desk occupy the bottom right-hand corner, level with the faders. A keypad provides immediate access to specific Scene Memories and also allows numeric data entry in suitable menu parameters. It can also be used for inputting names by repeated presses of the appropriate button to scroll through the assigned letters and symbols. Below the keypad, four cursor buttons allow navigation of the LCD screen menus, with a dedicated Enter key to confirm a selection determined by dialling up values with the jog wheel. The DA7’s cursor keys, used to navigate its many menus, also double as MMC transport controls, which can lead to confusion!As an alternative, a Cursor Mode button allows the jog wheel to be used to scroll around the menu items instead, although the mode has to be disengaged to allow the dial to select a parameter value. If this sounds complicated it is because it is, and I found the best way to work was with the cursor keys for navigation and the wheel for data entry. To make matters worse, if the MMC transport mode is active (selected by a button above the jog wheel), the keypad, cursor and cursor mode buttons take on transport control functions instead, which makes driving the desk even more complex and prone to error! Presumably Ramsa have resorted to combining functionality on to this restricted number of buttons in order to reduce the production cost of the console, but I can't help feeling that by cutting these critical operational corners they may also lose some of the potential client base. The one thing a professional requires is something which is fast and easy to use, and multi-function controls rarely allow that — especially when the console control and remote transport functions share the same buttons! A dedicated section of the control panel provides access to the main setup and configuration functions of the desk. Six buttons provide access to the Utility, MIDI, Digital I/O, Group, Automation and Solo Monitor windows. The Utility windows offer control of talkback routing, the 5.1 surround mode configuration for the main monitoring, the line-up oscillator and the Solo monitoring configurations. These last include the usual PFL, AFL, and Solo-in-place modes, with either exclusive (one channel at a time) or multiple source modes. Furthermore, the entire Solo system can be disabled if required and the level of soloed sources can be preset to any desired level up to 10dB above normal. There is also a 'Clear All' button to cancel all Soloed channels. The line-up oscillator can be routed to the eight busses, the six auxiliaries, or master stereo output, with eight different frequency selections as well as pink noise — all at any desired level. The desk offers a lot of user-configurable options, such as whether the LCD display changes automatically to reflect the parameter being adjusted — for instance, the equaliser window opening when an EQ knob is adjusted. Similarly, the channel overview window can be displayed automatically whenever a channel fader is moved. The list of tweaks is extensive and there are few aspects of the console that can not be optimised to personal preferences. There is even provision to 'lock' various sections of the desk allowing access only with a password. This could be useful in a theatrical application where, say, an operator could have access and control of faders and scene memories, but not to change EQ or routing assignments. The MIDI implementation is just as comprehensive as everything else on the DA7. Not only will the console output MIDI control data to drive external devices, but it will also respond to incoming data too. For example, program changes equate to 'mixer scenes' and control changes to remote control of channel faders, pan controls and the like. The desk also recognises non-registered parameter numbers for certain functions, can perform full MIDI data transfers, and uses both MTC and MMC for interaction with external recording devices. As already mentioned, the problem with the MMC commands is the reliance on shared function buttons. The MMC transport buttons are comprised of a combination of the four cursor buttons, the keypad and the Cursor Mode button — the latter doubling as the Record key, which seems a mite dodgy to me! A button above the jog wheel selects either Cursor or MMC mode for these buttons, and I found it remarkably easy to end up sending MMC commands when I wanted to change a parameter on screen, and vice versa. The digital I/O flexibility is definitely one of the strengths of the Ramsa, with the three slots available for external interfaces and some clever internal routing options. The control window allows the user to set the clock source (internal, external word clock, or external digital input), sampling rate, and if the SMPTE/V-SYNC card is installed, video synchronisation options can also be determined including drop-frame modes and 0.1% pull-ups and pull-downs for NTSC compatibility. The only trap I found here was that unless the word clock input socket is terminated with the associated slide switch, the word clock output socket is connected as a loop-through and so does not supply the desk's internal clock signal! As part of the same window, a table identifies the digital inputs (2‑track A and Slots 1-3), confirming their format and whether their input signals are recognised by the desk. This is indicated as 'locked' and, if satisfactory, can be designated as the desk master clock source. A clear graphic block diagram shows part of the digital input routing complete with three changeover switches. The first of these determines whether channel inputs 9 to 16 are taken from the analogue inputs or from Slot 3 (the Flip LEDs on the corresponding channels are green for analogue inputs and orange for Slot 3). If the analogue inputs are selected, the second switch selects the 2‑track A digital input as an alternative to analogue inputs 15/16. The third switch routes the 2‑track A input directly to the master stereo buss, but it is always available in the monitoring section. A second window associated with the digital I/O configuration determines the signals for every output of each port, acting as a comprehensive patchbay. Normally, busses 1-8 would be presented for traditional multitrack applications, but the window also allows each track to be independently derived from inputs 1-32 (ie. direct feeds), aux sends 1-6, mix busses 1-8, or the left or right stereo master output. A 'Clear' button associated with each Slot sensibly resets it to the default condition. The third digital I/O window sets the bit resolution of the various digital outputs: Record Out, Aux Send 1&2, and Slot 1-3. Each of these outputs can be independently set to provide word lengths of between 24 and 16 bits, with reductions correctly dithered. Selections are always made in pairs, with both legs of the Record Out and Aux 1/2 as a pair, and odd/even pairs of channels in the Slot option cards. To make life easier when setting the Slot card options, once outputs 1/2 have been set, pressing the All button copies the settings to outputs 3-8. Ramsa have missed an opportunity here by not incorporating any means of bit-splitting higher resolution outputs across multiple tape tracks — something that would presumably have been easy to do, and for which there is a proven market. The next configuration button is labelled Group and determines fader groups, mute groups and channel linking. There are four fader groups and four mute groups, channels being assigned by a simple onscreen matrix. 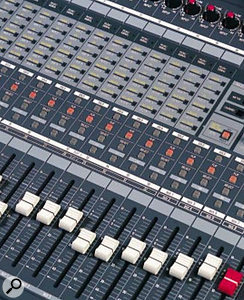 Fader groups work much like VCA groups on an analogue console and allow any channel or Aux return fader to be controlled by any other fader within the same group (channels can only be allocated to one fader group at a time). The four mute groups are configured in much the same way, although there are two setup pages, one for inputs 1-32 plus the six aux returns, and a second for the aux sends and eight mix busses. Linking is available between adjacent odd/even pairs of all 32 inputs, the eight mix busses, six aux sends and the six aux returns. I found it easiest to set up linking from the dedicated page, but channels can also be linked by pressing the Select buttons of both channels simultaneously if preferred. Linking is a two-stage affair, as channels can be linked or stereo-linked, and the dedicated page makes it easier to determine what is going on! In the 'Link' mode, the status of the two channels before linking is retained, so they may have different fader positions or EQ settings, for example. In the 'STR' mode, the settings of the even channel are reset to match those of the odd channel in the true sense of stereo linking. The Ramsa DA7 is an impressive desk in so many ways, but I feel it also has a few too many significant weaknesses to be the breakthrough we had hoped for. In terms of its capacity — 32 inputs, six aux returns, two 2‑track inputs, the potential for three digital multitracks allowing 24‑track recording — this desk is phenomenal and it blows much of the competition away at the price. The equalisers sound extremely good and far better than the technically accurate but sonically poor offerings of many digital desks. The DA7 also offers long-throw faders with sensible physical spacing, fast and accurate motors with minimal chatter in normal use, good use of fader layers, and a very clear uncluttered panel surface. The analogue inputs sound good, being both quiet and surprisingly faithful to the source, and the assignable channel controls are clearly laid out and easy to use with clever over-press knobs to access some key functions. The digital I/O options are extremely comprehensive and well thought out, and the possibility of providing digital or analogue insert points in the mix busses via Slot 3 is also most welcome. Indeed, the technical spec of the entire desk is hard to fault. The weaknesses are really all to do with the lack of dedicated controls, particularly in the cursor/transport sections, which I just couldn't get along with. Assignable controls for channel parameters is one thing, but when those same controls double up as surround sound panners, and when the screen menu navigation buttons — the most used buttons on the desk — become MMC transport controls, assignability has gone too far! Talking of surround sound, the designers have obviously tried hard to accommodate 5.1 surround requirements, but in their efforts have made working in LCRS (which will remain a very widely used format for many years to come) almost impossible, and have made no provision for returning an externally processed 5.1 signal through the monitoring, so that the essential Pec/Direct monitoring (ie. comparing desk out with recorder replay to match console settings for a drop-in) cannot easily be achieved. If I were to be picky I could also complain about the onboard automation memory being rather paltry, although it is sufficient for the casual user and external data dumps and imports are well catered for. The automation system itself is very good despite some operational traps which the handbook is not too clear on. I haven't seen it working, but the idea of using an external computer (PC or Mac, note) to display and control the desk functions may help to resolve some of these operational shortcomings. According to sources on the Internet, a firmware revision which addresses some of the desk's shortcomings is already available, and I dare say there will be others to follow in the fullness of time. On balance, I have to say I liked the DA7 and, if I didn't already have an 03D, would probably choose this desk as the core of my setup. It is obviously not perfect, but it does have some significant advantages over some of the competition in areas which I consider important (fader travel, nice EQ and a sensible number of analogue and digital inputs being a few!). However, it is certainly not leaps and bounds ahead of the likes of the 03D, 02R, Mackie d8b, or Spirit 328 — although I recognise that there are far too many fundamental differences between these consoles to allow straightforward comparison. However, a quick skirmish with the unofficial DA7 user group on the Internet suggests that there is no sign of any major problems and the vast majority of owners seem very pleased with their purchase, which has to be a good sign. The DA7 provides quite comprehensive support for working in 5.1 surround (but not LCRS), although it involves a serious reallocation of resources. As might be expected, the eight mix busses are used to provide the necessary surround outputs, albeit in a rather strange order where buss 1 carries left, 2 right, 3 centre, 4 sub-bass, 5 surround left, and 6 surround right. A surround monitoring mode is provided and works by either reallocating the four analogue aux sends to supplement the main control room monitor outputs, or by utilising the studio monitor feeds and the master stereo outputs in conjunction with the control room loudspeaker feeds. A virtual master level control to adjust all six monitoring outputs simultaneously is available in the console's surround monitoring setup area. The DA7 manual advises using an external proprietary surround processor, essentially because the sub-bass channel is normally derived by filtering off low-frequency information from the five main channels — a function not provided within the desk. However, the DA7 does provide a dedicated subwoofer channel to which special effects can be directed as necessary. Unfortunately, if an external processor is used there is no obvious means of returning external surround signals into the console's monitoring, and neither can the six channel returns from an external recorder be monitored, so separate arrangements would have to be made in that respect. The surround sound window display incorporates a two-dimensional plot of the present panning position and the settings of the six output level controls. There are three operational modes: 'Send Vol' allows each channel output volume to be determined individually, either from the soft-knobs on the screen (via the jog wheel), or through the assignable panel controls (EQ, pan/assign and dynamics knobs). In the 'Jog and Fader' mode, the wheel determines left/right angle and the master fader the forward/backward positioning. The third mode is 'Pattern', which allows a preset transition to be programmed. Sound moves can be composed from a combination of up to five shapes (straight line, curved line, or circles/ovals). Programming a transition is just like using any computer vector drawing program and, once designed, the move can be triggered to run over a preset time period once only, once with return, repetitively, or in reverse (from end to start). All of these settings can be stored by the automation system, of course, and in the multi-channel view, surround panning settings can be copied to or from other channels. Although it took a little while to become completely familiar with the surround parameters, once mastered it proved to be a very powerful system indeed, and one which is surprisingly easy to use, although the doubling up of panning controls with the EQ, Pan and Dynamics sections is a little confusing. One interesting function is a preset adjustment of the balance between the left and right front outputs against the centre channel. The default is 10:0, which performs all frontal panning with just the left and right channels — a pan from left to right involves increasing the right channel and decreasing the left with nothing sent to the centre output at all. The converse, 0:10, provides a centre-emphasis pan where the centre channel is very active. The same left-right pan would start with the centre channel being increased before the left channel is decreased, then the right would increase as the centre is decreased. The intermediate points in the ratio alter the relative balance between left/right and centre level controls to create alternative panning laws. The console specifications read impressively, with a microphone equivalent input noise of -128dBu at maximum gain with a 150(omega) source and residual buss noise of better than -93dBu. The dynamic range through both A‑D and D‑A stages is better than 110dB although this figure varies slightly depending on which ports are measured. The main input A‑D converters are 24‑bit 64‑times oversampling types, with 20‑bit versions for the four analogue aux returns. The D‑A converters are all 24‑bit types but with a 64‑times oversampling topology for the master output and control room monitor feed, and 128‑times oversampling versions for the studio monitor feed and analogue aux sends. Internal processing is 32‑bit fixed point, offering a processing dynamic range of 192dB — more than enough for most purposes! The processing delay from analogue input to analogue output (Master output) is less than 2.5mS, the bulk of the delay being due to the oversampling filter stages in the converters. Total harmonic distortion is quoted as better than 0.1% at 1kHz. On the whole, the DA7 performance figures are directly comparable to Yamaha's 03D and 02R consoles, although the Ramsa desk provides 8dB more gain from mic input to master output, and the crosstalk figures are better — both of which imply better analogue circuit design and construction — and informal comparative listening tests suggested that the analogue stages of the DA7 sounded cleaner and more precise than those of the 03D. Many people purchase a digital desk purely for the total automation capability, and the DA7 is no slouch in this department. Unlike some other desks on the market, automation data can be stored internally, although the capacity is rather limited and dumping to computer or MIDI filer is preferable. The automation functions can be based on an internal time base, but it is more likely that an external synchronisation reference would be used and this may be MTC (MIDI Time Code), MIDI Clock, or external SMPTE timecode (via the option card). The first part of the automation is the Scene Memory, which defines the starting position of virtually every operational control on the desk. The 50 scene memories can be named, various elements of the channel controls excluded from or included in the memory, and once stored, can be protected against accidental erasure. Specific channels can also be isolated from a scene memory recall — a crucial facility for theatre and broadcast applications where a live mic can be maintained during a scene memory recall. When a new scene is recalled, the channel parameters can also be programmed to crossfade over a preset time to smooth the transition. The onboard automation system stores up to 32,000 events of 41 different parameters, but in one of only four user memories. Automation events include real-time settings and changes for all EQ elements, fader positions, panning, surround sound routing/panning, and aux sends. In addition the system also records on/off status of the channel, delay, and dynamics sections, plus recalled scene memories, and channel, EQ and Dynamics libraries. Individual channels can be isolated from the automation if required and, as with most desks of this type, a scene memory should be recalled as the first automation event to reset the desk correctly on future automation replays. In case of mistakes, there is also an optional 'Undo' capability, although this uses some of the already fairly paltry automation event memory to store previous automation actions. The onboard memory is adequate for small projects, but the only practical long-term solution for archiving projects or managing larger mix sessions would be to download automation data to a dedicated MIDI data filer, sequencer, or an attached computer. The automation can be set up to record only specific functions such as faders, EQ changes, pans and so on, and there are the usual fader update modes of Absolute and Relative with selectable crossfade times. Automation events can also be edited off-line through a menu screen which presents all the recorded data in a text/time tabular form. Personally, I found it quicker to run another selective pass to correct the duff element than to fiddle around with the editing screen, but if you have the patience and inclination, the facility is here! 22 analogue and up to 28 digital inputs. Very flexible digital I/O and clocking options. Both analogue and digital 2‑track monitoring. Multi-function controls hinder operation in some respects. No LCRS support, and slightly flawed implementation of 5.1 surround. With 16 analogue inputs and up to 24 tracks of digital I/O, a range of professional features and superb specifications, this console will appeal to a very wide user base. WR-DA7 mixer £4111.33; optional meterbridge £752; ADAT and TDIF cards £229.13 each; A-D/D-A expansion board £282; SMPTE Sync card £376; Tandem card £411.25; AES/EBU card £282. Prices include VAT.